Before the casual social gaming boom of Guitar Hero, Wii Sports et al, video gaming was often accused of being a solitary experience, and the traditional image of the platform adventure does little to change this. Two-player takes on this model often felt bolted on, or just plain unnecessary. The received wisdom is that platforming is an activity best enjoyed alone. Treasure Treasure: Fortress Forage: Extra Edition is, however, a resolutely two player platforming experience presented here for Xbox (via the oft-neglected XBLIG xbox indie games channel). 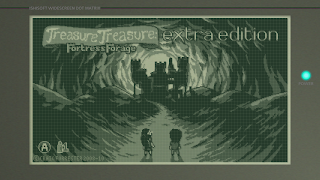 Its slightly ungainly title betrays it as an update of ‘Treasure Treasure: Fortress Forage’, a freeware PC indie title from 2008. TT:FF:EE takes a very simple play mechanic – left/right, climb up/down plus jump – and tweaks it by having two playable characters with slightly different attributes; Trixie, who can jump higher, and Troy who can push heavy things and handle the bombs that are strewn around the play field. Together they must navigate a large single area – the fortress – to open all 21 treasure chests contained within. Blocks must be pushed to allow access to previously inaccessible areas, bombs must be used to destroy other blocks to allow access to previously inaccessible areas, Trixie and Troy must stand on one another to allow access previously inaccessible areas. Can you spot a recurring theme? So far, so familiar – but what makes TT:FF:EE special is the obvious love that developer Craig Forrester (Ishisoft) has lavished upon it. 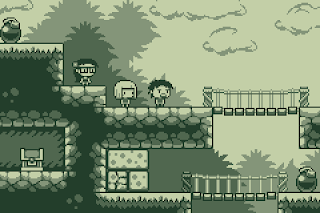 A one man operation, he is clearly very adept with a four-greyscale pixel art palette, thus creating utterly charming Game Boy-like visuals, with a gloriously retro flavour, aided by an 8-bit tune playing throughout that falls just on the twee side of irritating. The whole thing is rounded off with excellent presentation within a knowing ‘Game Boy’ border. All this window dressing aside, it is the not-so-simple challenge of getting to the treasures that really delights in this game. The first few treasures are easy, but very soon after that, the head scratching begins… Should we have used that bomb for something other that the obvious? 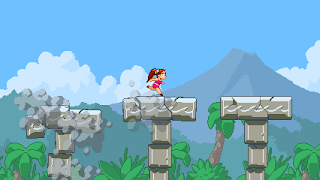 Did we push that block to get that treasure, when we should have, in fact, landed it on Trixe’s head and moved it onto that ledge there? Repeated plays with the game gradually reveal its secrets and eventually as a couple you are finding your way to hither to unreachable treasures. Despite having only one ‘level’, rest assured that this game is no pushover. Technically the game oozes class – with tight controls, and a dynamic split screen that allows the players to go their separate ways should they wish to - by cleverly slicing the screen as they get too far apart. The game also supports a drop in / drop out mechanic for the second player, and can be played with just one player swapping between the characters – although ramps up the difficulty and, as a one player game only, can not really be recommended. Perhaps the only fly in the ointment is a lack of save, so restarting is required each play through, although it is only through restarting that you’ll progress having realised what you have done wrong on a previous play-through. The notoriously poor d-pad on the Xbox controller can be responsible for some frustration, but using the stick remedies this (although die-hard Game Boy fans will wince at the thought). There is no question that the game is worth the meagre asking price (80 Microsoft points, about 70p), although veterans of the PC incarnation might churlishly note there is not all that much different in this Xbox version – one extra treasure to find, and a spangly split screen effect – but at less than £1 such complaints should be very muted. Perhaps more disappointing is the lack of leaderboards – as once completed and ‘learned’ this game would have made a great score/time attack game. 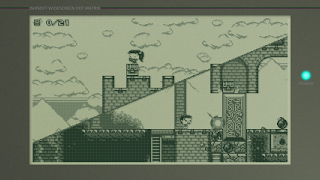 If you have been hankering after using your 42” HD TV screen for an excellent quality fabulous looking local co-op two-player Game Boy game that drips with charm, then look no further. If you haven’t had that hankering … why the devil not? Grab a real-life friend and give it a go! Download TT:FF:EE (or the trial version) here (from the XBox Marketplace). Download the original PC version here (from the Ishisoft site). 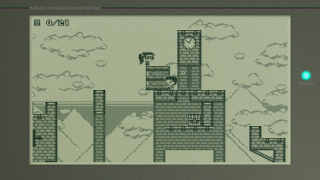 TT:FF:EE is obviously an homage to the original Game Boy classic - Did you have particular love for that hardware? Or was it purely the recognisable art style that made you do it? I really love the Game Boy; it was my main source of gaming when I was younger, so I have tons of nostalgia for it. It also features a couple of my favourite games ever, Zelda: Link's Awakening and the original Wario Land. I often do some pixelart doodles in the four-colour Game Boy style, as it's quite enjoyable to see what you can get out of those limitations. TTFF started off as one of those doodles. How feasible do you think Treasure Treasure would have been as an actual GB game? Is this something you'd want to take on? I didn't pay any attention at all to Game Boy hardware limitations whilst making TTFF, apart from the overall four-colour palette, so it's probably not very well suited to the platform. I love the idea of making an actual Game Boy game myself, but I don't think I could deal with the difficulty of development. I'm too used to being able to throw whatever I want into a game without worrying too much about limitations of the hardware. The two player co-op mechanic is unusual in it being so fundamental to the play - with the one player option feeling like a compromise. Was there any particular reason for this? The original PC version of the game was intended purely as a two-player experience, and didn't feature the single-player option. With the Xbox version, I felt that I had to provide the single-player option since I was charging money for the game. I really hope that people still make the effort to play it with a friend though, as it's good fun - especially when you're both sat on the sofa, rather than being crowded around a PC keyboard. What other two player games do you rate? One of my favourite co-op games this generation was Lara Croft: Guardian of Light. It's got a great mix of puzzles and action, and doesn't take itself too seriously - it feels very much like a video game, right down to the collecting of enormous floating gems. By coincidence it shares quite a few similarities to TTFF, featuring a male and female character with differing abilities hunting for treasure. It has way more spiders, though. A couple of upcoming two-player games I'm keeping an eye on are Ibb and Obb and Wyv and Keep. Game developers who choose to write local co-op games have more friends/siblings than those who do not. Discuss. Hmm, well I have one brother, who I did play games with, but largely we just played our own single-player games in our hour-long turns on the PlayStation. I also played games with friends often enough, but nowhere near as often as many other people did. So I've never been obsessed with multiplayer or anything. On the other hand, local multiplayer has provided a lot of my most memorable gaming experiences. Playing three-player through the whole of Final Fantasy Crystal Chronicles one summer, completing the GBA version of Zelda: Four Swords during time before exams, and gathering around a tiny TV playing split-screen Phantasy Star Online in the first year of university. So, I think I've just been lucky enough to have some great local multiplayer experiences (specifically co-op ones). I'm aware of Head Over Heels, and the general idea behind its mechanics, but I've never played it. I'll make the effort to give it a go, as it should be up my street! One of the most striking features of the revamp from the PC original to the XBOX version was the dynamic handling of the split screen. Was that tricky to implement? That split screen feature was "inspired by" (nicked from) LEGO Harry Potter, which I was playing at the time. There were a couple of tricky things about it. When I first implemented it the split felt a bit too close to the characters, when the split was diagonal across the screen. You ended up not being able to see much on one side of your character. I think I altered the split slightly, but it wasn't working too well still, so I put in some code to steer the split towards being directly vertical or horizontal where possible. This generally gives the players more vision to either side. There are very few Xbox indie titles with online components, especially co-op. Was this ever considered for TT:FF:EE? It crossed my mind, but not for long. The main reason is a purely practical one; online play creates a massive amount of work, can be very error-prone, and is extremely awkward to test for playability and bugs without pestering lots of people for help. From a gameplay point of view I also believe that local play suits the game far more. I wouldn't personally have any desire to play through it over the internet with someone. Any lag introduced by online play would be rubbish, too. You've intimated previously that there may be a sequel planned. How is this progressing? What format are we likely to see it on? Any e.t.a.? Spoil us with spoilers! I'd love to make more Treasure Treasure. I've got loads of ideas, including a possible third character, a bit of backstory, and an enemy group of treasure hunters. I've started a couple of prototypes of the game in various forms, but not settled on anything yet. This is a bit cliché, but I'm waiting until I feel the time is right to make some progress on it. You appear quite comfortable developing on a number of platforms. Has the Xbox indie money model turned you into a wealthy man who lives in a gold plated mansion yet? I'm a fair way off the mansion, and nowhere near having any gold to put on it. I certainly haven't made a fortune from the games, though the money will help towards paying off my student loan. I recently started having a look at making Flash games, hoping to achieve more rapid development of simpler games. XBLIG has drawn me back in for now though. The money isn't really a consideration in that. The main thing I enjoy is simply being able to put my games out on consoles. I rarely play games on my PC nowadays, so I prefer to release my games in a form where they can be played on consoles from the sofa. From a development point of view, it's also great to know exactly what controller and hardware the player is going to have, so you can tailor the game experience much more closely. Can you recommend any other Xbox indie games that RGCD readers might enjoy. I'm really enjoying Blocks That Matter at the moment. It mixes platforming and puzzling in quite an unusual way; you can harvest blocks from the environment, but you can only make use of them by placing them in Tetris shapes. On paper that's quite an arbitrary rule that I couldn't have come up with myself, but it works really well. The music is fantastic too, which I always appreciate in a game. Do you find that you need to wear different hats as artist and programmer? Creating assets for a programmer is often outsourced, but in this game you have obviously had these in mind (and least stylistically) from the outset - how does this influence the creative process? I do have to juggle the art and programming roles, but I really enjoy doing so. 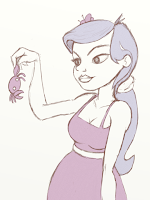 My creative process is very loose, basically involving me working on whatever I fancy working on at the time. 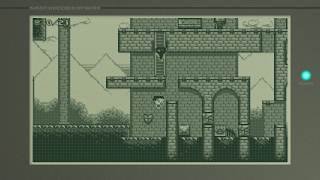 Most games begin with me doing a mockup or sketch, and before I know it I've started work on a full game. I don't tend to do any programming work without at least some art assets to work with, for example I'd never use a blank square sprite as a placeholder player sprite. In that way the art can often lead the way ahead of the programming. I usually have a half decent idea of how I want the game to play, though. I'm rambling a bit now, which is probably a good indication of how my games are put together. For the record, I never plan any code either! I just throw it together and hope it works out. Anything you want to say to RGCD readers regarding this, or your other titles? If you play TTFF, please play it with someone! If you try one of my games, I hope you enjoy it. If you've already played any of them, thanks! (Readers may also be interested to know that Craig / Ishisoft’s latest game, ‘UpBot Goes Up’ is available on XBLIG from here now).